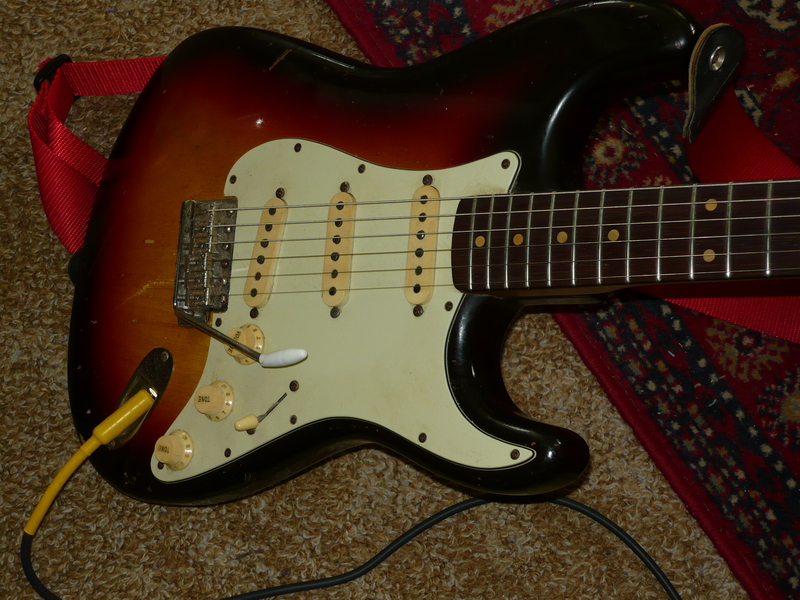 In this week’s blog we get together with some members of the Sydney Shadows Club, ie guitar playing enthusiasts who love the guitar instrumental music popularised by the Shadows (UK) and many others, in the late 1950’s/early to mid 1960’s. The local NSW Central Coast enthusiasts get together for an all day jam session every 2nd Thursday by invitation only at a private residence on a small acreage (so no complaints from neighbours !). I make a point of attending this jam session whenever possible, at least for an hour or so. 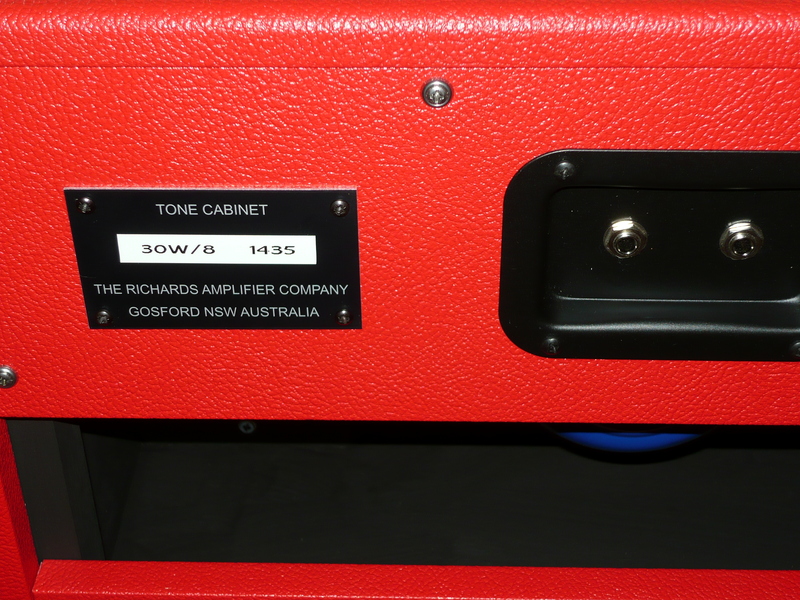 You will notice there are always a couple of Expressionist series amps from the Richards Amplifier Company – Australia in attendance. 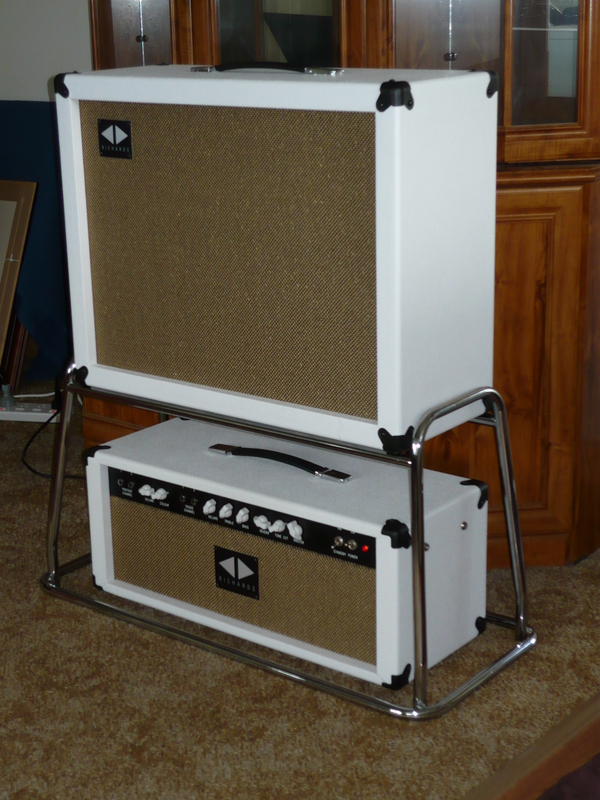 On this particular day, I turned up with a newly completed 1×12 tone cabinet, which was a custom order for Chet Romero, an Aussie slide guitar specialist, loaded with the Weber 30W Blue Dog speaker. 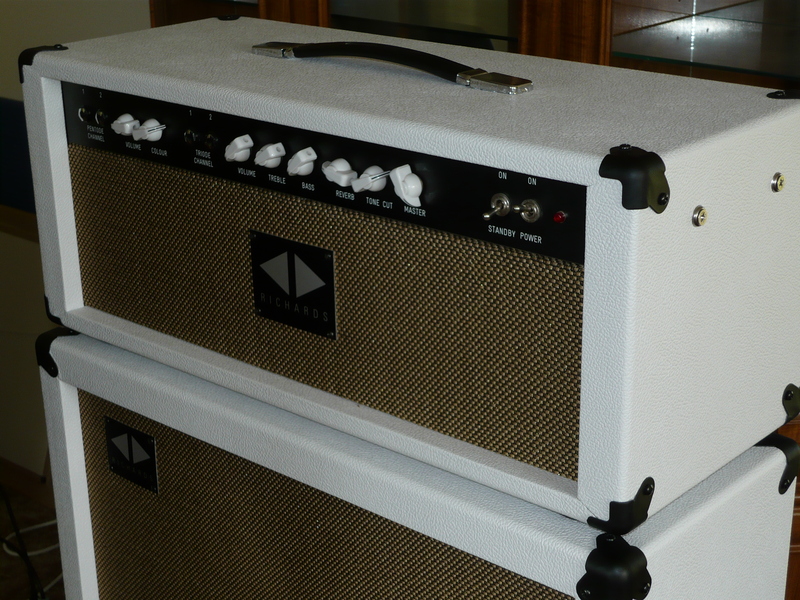 We have supplied this specific Weber model on previous occasions with our Expressionist amps, always with great results. 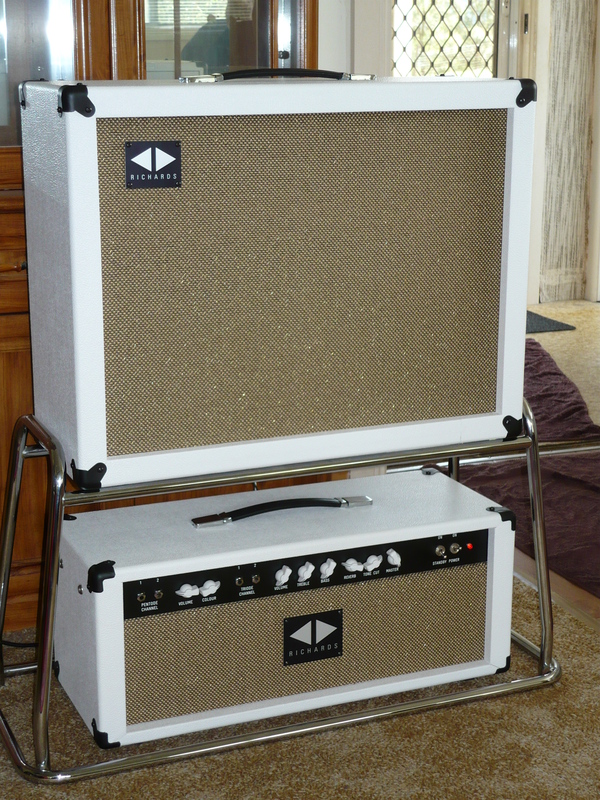 Part of the afternoon was devoted to conducting comparison tests between the Weber loaded 1×12 cab and a well played in 1×12 cab loaded with the mighty Celestion 15W Blue Alnico model. 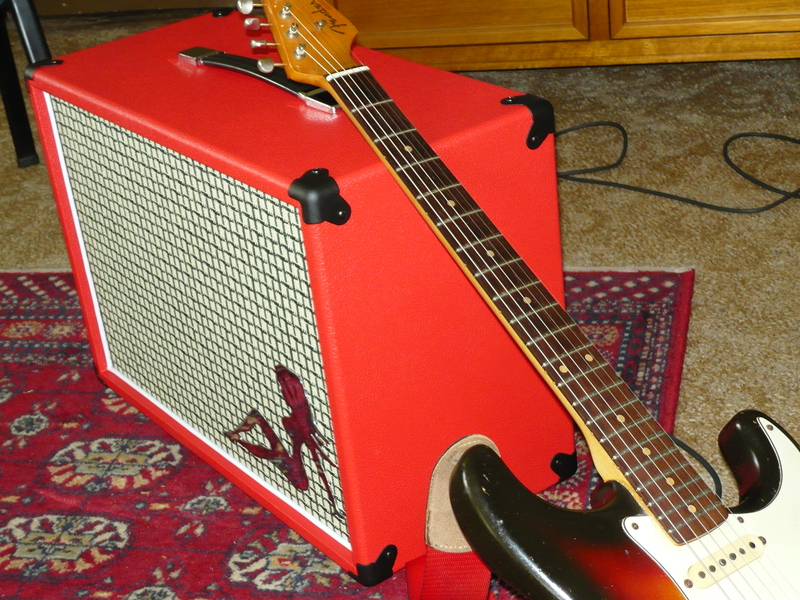 The cabs are of identical proportions, athough the older Celestion loaded cab was a TV front style, and had a brown basketweave grille, as distinct from the checkerboard grille of the (red) Weber loaded cab. The different grilles do have an impact on tone. We will explore this issue in a forthcoming blog. Well, both speakers sounded great in their own right, but there were unexpected differences. 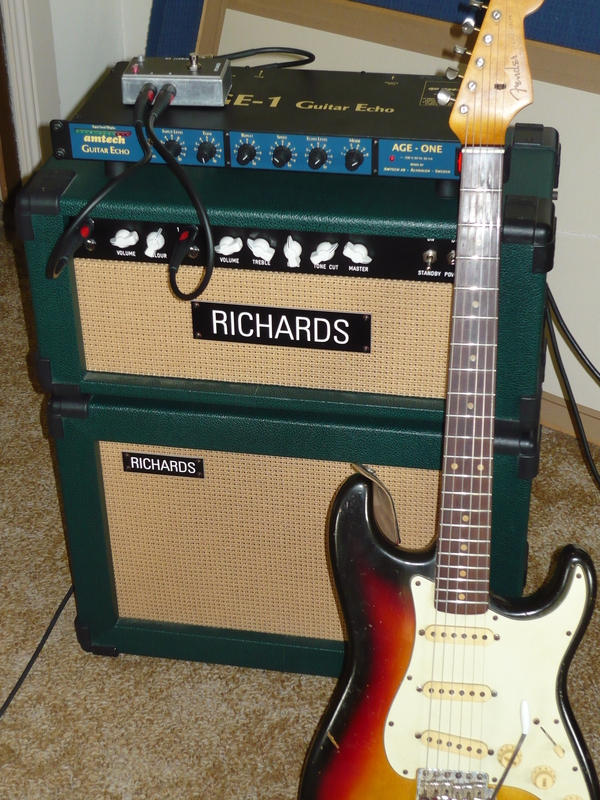 In all comparisons, a 1963 Fender Strat in original condition was played through a 7.5W Richards Studio Expressionist amp. 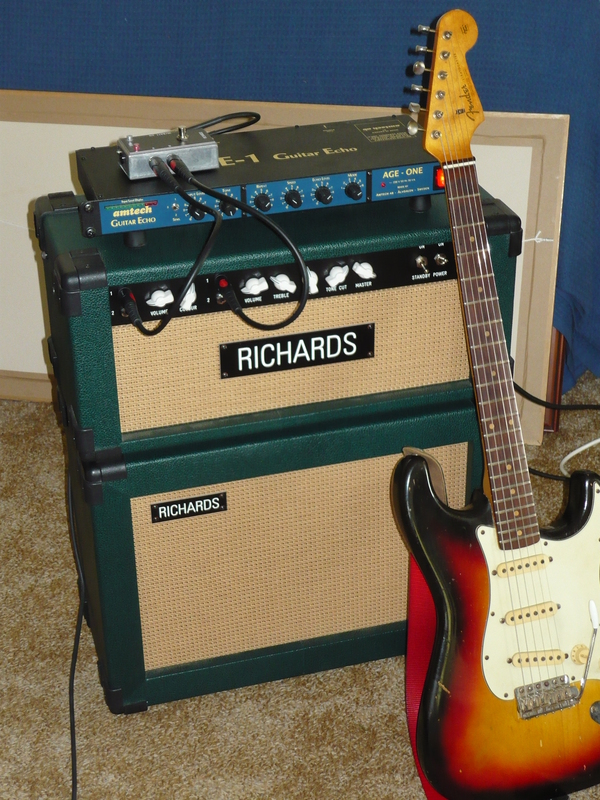 This amp was designed from the ground up for home studios and/or home jamming, and sounds just as good as the 15W and 30W models, its just that it breaks up earlier. 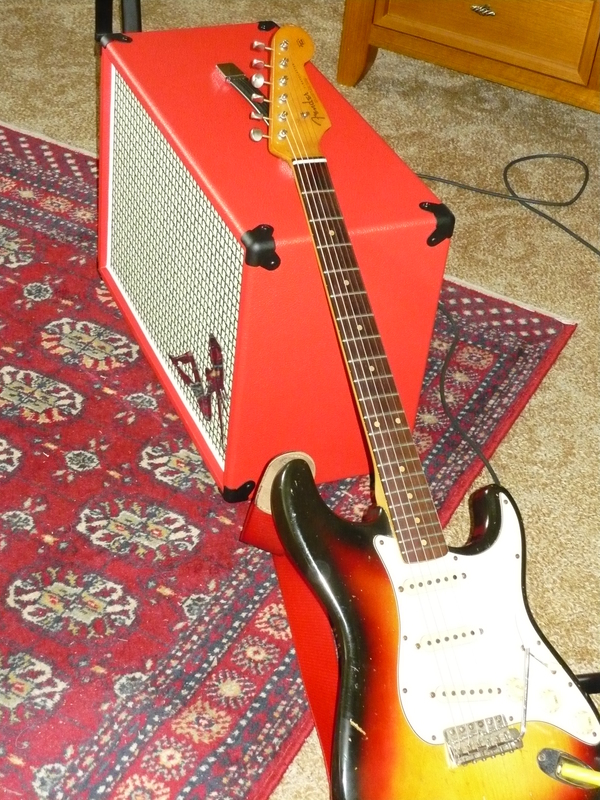 The ’63 Strat played through such an amp easily replicates the classic Hank Marvin tones from the Shadows golden era. The majority opinion after numerous Shadows instrumentals was that the Celestion Blue was a bit brighter (but not in a bad way) and quite noticeably louder, and broke up later ! The Weber lacked the characteristic growl in the lower midrange of the Celestion, in fact if anything it was the more refined of the two. However, we all agreed the Weber sounded great, in spite of the earlier break up. We were intrigued by the fact that the Weber imparted this delicious kind of midrange gronking quality on the wound strings of the Strat. Actually, I don’t have the appropriate words to describe it, but it was definitely there ! The chrome plated stand you see in some photos was one of a number custom made for members of the Sydney Shadows Club by an enterprising fellow. These stands replicate the look of the original stands used by groups such as The Shadows and The Beatles with their Vox amps back in the day. The Shadows, and Hank Marvin in particular, had their own signature model Burns guitars back in the day. Some of these models have been reissued by Burns of London in recent years, although no longer made in the UK. They do capture the tone from that period quite convincingly, and the well-engineered tremolo (vibrato) design works well for this style of music (but probably not for dive-bombing styles). In our final two photos we have the ’63 Strat with the 7.5W Studio Expressionist amp and 1×12 tone cabinet loaded with the Celestion Blue, as used in our comparisons. On top of the amp is a Rich Switch A/B to switch between the two distinct channels, and a tape-echo simulator that probably very few of you have seen – the Amtech Age One. The Amtech is manufactured by a small Swedish company I believe, possibly their main products are in the medical equipment industry. But whatever it is they do, they are obviously serious Hank Marvin fans, as they designed a completely analogue circuitry tape-echo simulator, built in a 1RU high rack-mount enclosure, that comes closer to anything else I’ve ever heard to specifically reproducing the tape-echoes that played such a major role in recording the Shadows sound. The other cool characteristic of the Amtech is that the preamp sounds very good on its own, with the echoes bypassed. A very warm and musical analogue sound. 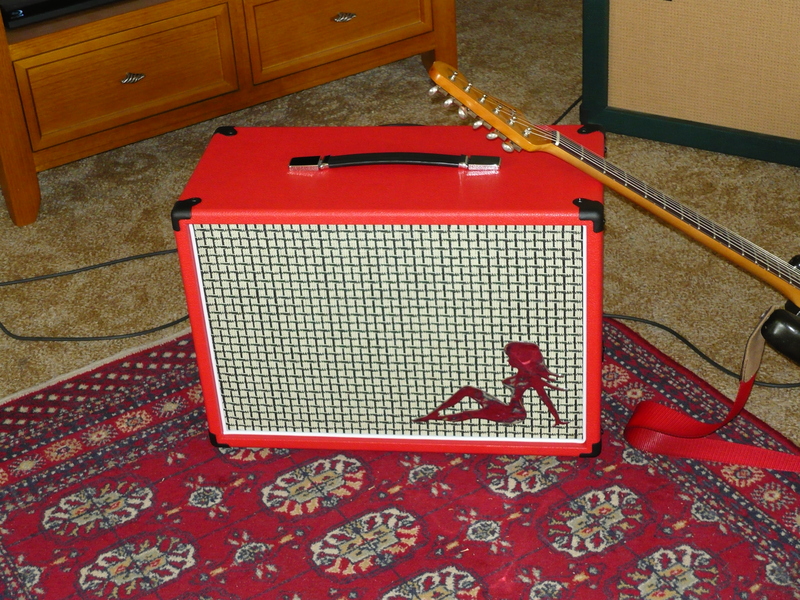 The pictured amp was one of the very first in our Expressionist series of models. These amps, as per all our current range, were designed and built directly as a result of customer requests and/or suggestions. This example is the Studio Expressionist model, meaning that the output stage can be switched from a pair of EL84 output valves, operating in class-A/push-pull, to a pair of 6V6 output valves operating under similar conditions, but with different bias conditions. 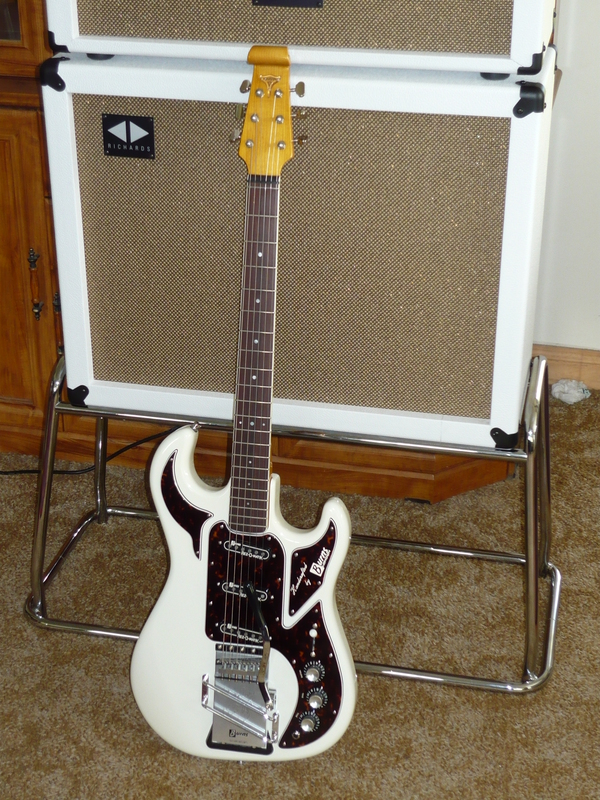 In either mode the amp is self-biasing. The unused pair of output valves remains at full temperature for instant operation, but is only drawing a trickle of current, extending valve life. In EL84 mode, naturally the amp sounds distinctly British, with either CH-1 (EF86 pentode), or CH-2 (12AX7 “top boost”), although Hank Marvin enthusiasts would automatically choose CH-1 for the most authentic tones possible from any amps we’ve heard thus far. In 6V6 mode with either channel, the amp delivers tones that would only be possible from some of the more obscure 50’s/60’s USA manufactured amps. For example, the combination of CH-1’s pentode preamp with cathode-biased 6V6’s would suggest vintage Gibson amp tones. Perfect for rock-a-billy, jazz, swing, blues, rhythm&blues, etc. CH-1 and CH-2 can be patched together in-phase (or combined with an A/B/Y pedal) for a huge tone. Well – thanks to the Shadows enthusiasts for their input into this week’s blog. Please see earlier blogs describing how the Expressionist series amps have been used for recording and performing by very demanding contemporary guitar stylists. For those who might be interested, I believe that Amtech have an Australian distributor. Please tune in again next week ! Regards – Ivan. This entry was posted on October 24, 2011 at 11:35 am and is filed under Discussion, Friends of Ivan Richards Audio. You can follow any responses to this entry through the RSS 2.0 feed. You can leave a response, or trackback from your own site.